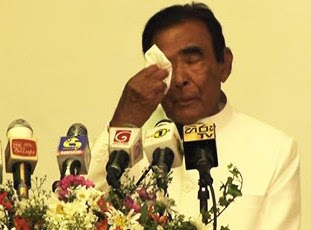 Former Prime Minister D M Jayaratne today made an emotional appeal to President Maithripala Sirisena, former President Mahinda Rajapaksa and former President Chandrika Kumaratunga to take measures to ensure the Sri Lanka Freedom Party does not split. Speaking at an event in Kandy yesterday, Jayaratne said that he feels very sad at what is taking place within the SLFP. He said that he personally met President Maithripala Sirisena and the two former President’s and appealed to them to protect the SLFP. Jayaratne, who was Prime Minister under Rajapaksa, said that he feels outside influence has resulted in attempts to split the party. “I am still attempting to unite these three leaders,” Jayaratne said. Jayaratne said that if the three leaders unite then the SLFP can easily win an election at any time. He said that so many SLFP supporters have urged him to unite the party and he will continue to make that effort. The former Prime Minister said that he knows he will not live long but his love for the party will never die.